I'm organizing a fun MUni ride at Manly Dam (only 20 minutes north of Sydney) on March 26th meeting at 8:30am. If you haven't ridden it yet, now is the perfect time so put it on your calender! It's an awesome 10km loop and fun for all skill levels from beginner to expert. 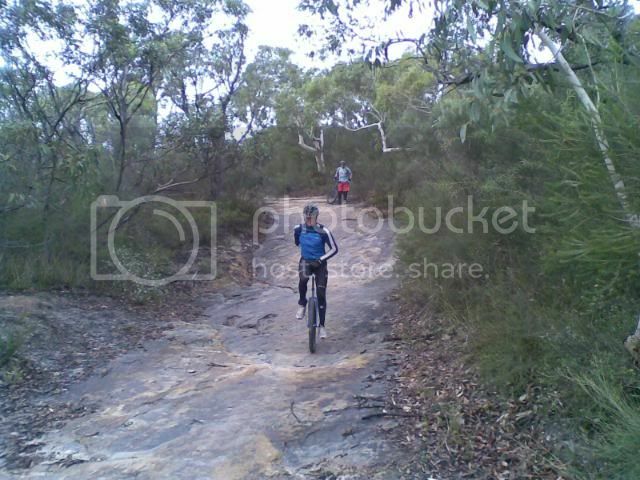 Has everything from firetrails, single track, uphills, downhills and technical sections. All difficult sections can easily be walked or ridden around. We'll take it nice and slow...stopping at the fun sections. Guessing it'll take about 2 hours or so to complete at a relaxing pace. More info on the trail and meeting spot can be found at http://nobmob.com/rides/manlydam. Early start time is so we beat the heat and I can work afterward. Let me know if you are thinking of coming so we wait for you before starting. PM me for my number so you can call if you are running late or get lost. If it's raining or the trail is wet than I'll have to cancel and re-schedule. I have an extra 26" MUni if anyone wants to give it a go. Plus I just posted a $100, $20 and $5 cash challenge for the trail. See the forums here http://www.unicyclist.com/forums/sho...81#post1434381 for more details on it. Spread the word and forward this to anyone that may be interested. Last edited by unicycle6869; 2011-03-16 at 04:45 AM. I'm up for Manly Dam,good initiative Jamey some times we just need to be prodded into action. Hi Jamey, I will come down and say hi. I am not good enough to ride around the dam but did duck across Allambie oval last week and dropped into the loop. I think I spent more time out of control and ran out of steam really quickly. I could get old gracefully.......but unicycling is way to much fun! *snip*I think I spent more time out of control and ran out of steam really quickly. Glad to see some people on board! Looking like we should have a half a dozen or so. Guess we'll see. Don't worry Geoff if you are not "good" enough. We'll be taking it slow and you can try any sections you want or just walk around them. This whole ride is a fun social thing to hopefully encourage more rides in the future and to help give people a little push to get on the trails! The trail is closed right now due to all the rain but I'm hoping and thinking it will re-open by this Saturday. I'll post here on Friday for the update. Trail is still closed so we might have to reschedule if it doesn't re-open by Saturday. Check here for a status update before heading out on Saturday. Had a great turnout this morning even though the weather was a bit drizzly we had 9 riders, 1 walker and 1 dog! Took us a bit longer than I had thought at just over 3 hours but we were in no hurry (well besides Cameron). Thanks everyone for showing up, I had a blast and was really impressed with all of you. Congrats to Ashley for making it up heartbreak hill and earning $5. But he did get a flat and had to give that money to John who luckily had an extra tube. Cameron had the only blood of the day which occurred right at the beginning, falling on his knee. Time to buy some leg armor! Sorry you missed your basketball game. There was also a two wheeler that fell at the very end of the trail and dislocated his wrist. Looked nasty and us one wheelers carried his gear and walked him to the cars. Called the ambulance but Richard offered to bring him to the hospital so we didn't need it. Thanks Richard! Hope he's OK. I still have his b*ke but don't know what to do with such a complex machine. Thank you Jamey for organising the Dam ride. Great fun. Didn't have time to thank you properly before doing the ambulance run. Murray was in a bit of pain by the time we got to the hospital, but I am sure he is doing fine. Would love to see the photos from today. I'll definitely be taking the uni up to the Dam again. Maybe next weekend with my youngest son, who also munis. Sorry for the delay with photos. I have to resize any that I want to post here so only posting the 2 best shots. If you want to see the rest of them, you'll have to befriend me on facebook. Just search for Jamey Mossengren, click friend and you can see all the shots I took and even download any of them in full resolution. If you really dislike facebook let me know and I can post any photos I have of you. BTW-Next time we should all go out for lunch/a beer afterward. Was planning on it but with the rain and hospital thing, decided not to. Talked to the injured guys dad and he told me he was in surgery for 2 1/2 hours and had to put pins/screws in his wrist. Not very good but I hope he's doing OK.
Great idea. I am in for another Manly Dam ride and lunch. I owe you a beer for organising last weekend's ride. Drink it before our next ride and I'll buy you another couple for after. Let's do another fun social MUni ride! Anyone is welcome and we'll go out for lunch/a beer afterward at a nearby restaurant for anyone interested. 3) Paramatta Lakes (http://www.trailflix.com.au/tfx_new/...ake_parramatta) Note: Never ridden so someone else would have to be the "guide". And we'll make a decision a few days before so check back here for the location. If it's raining or too wet we may have to cancel, again check back here for the status. Hope to see you there!